A weeklong Adventure Camp designed to get children off the couch and exploring local nature trails was recently held at the Nordic Heritage Center in Presque Isle, with enthusiastic response from those who took part. 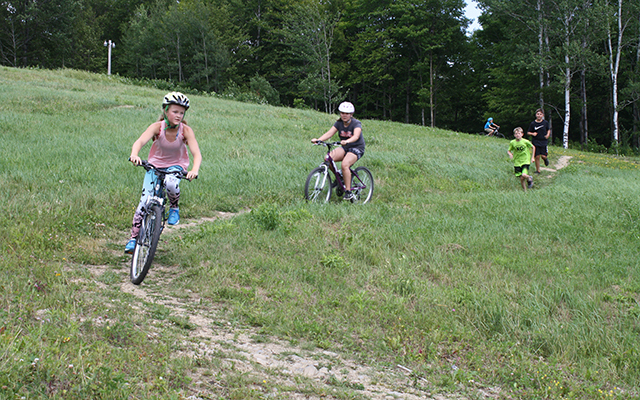 PRESQUE ISLE, Maine — A weeklong Adventure Camp designed to get children off the couch and exploring local nature trails was recently held at the Nordic Heritage Center in Presque Isle, with enthusiastic response from those who took part. From July 23 to 28, nine campers from fourth to eighth grade joined Camp Director Shea Brown for a full schedule of activities that ranged from mountain biking and hiking to setting up a campsite and building fires. “I think because we’re in an age of electronics and technology, it’s even more important that kids have the opportunity to appreciate the outdoors and realize that they can have fun with what’s already given to them,” Brown said. 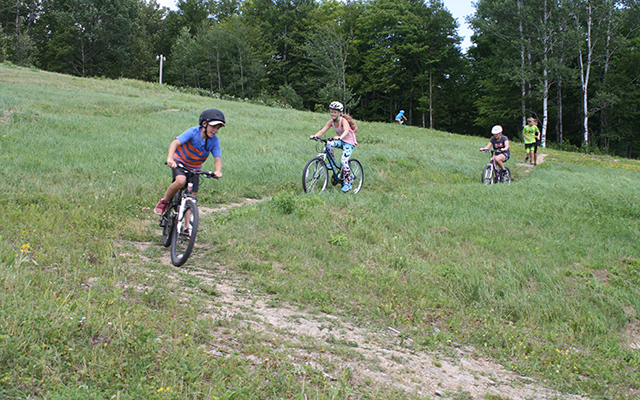 The group kicked off the week with a kayaking and swimming trip, which was followed by mountain biking trips on Nordic’s PI Hut Trail, Moose Trail, ZigZag Trail, Eric’s Around the Mountain Trail and Goat Trail on Tuesday and Wednesday. Other activities during the week were to included rock climbing at the University of Maine at Presque Isle’s Gentile Hall and learning how to build a lean-to shelter and campsite at Nordic. The weeklong session also included overnight camping Thursday through Saturday morning at Nordic and Nordic Trail Festival events on Friday evening. Previously hosted by the Presque Isle Recreation and Parks Department, this year’s Adventure Camp was the first to be held as a collaboration between the Nordic Heritage Center and UMPI. Brown is a continuing education specialist for UMPI’s business program, which oversees the university’s recreation program and also has taught summer hiking and mountain biking classes at Nordic and skiing lessons at Quoggy Jo Ski Center. Brown said she immediately supported the idea for the Adventure Camp after Gene Cronin, Nordic Heritage Sport Club president, reached out to her. UMPI was able to provide Brown’s time and recreational supplies such as kayaks, bicycles, tents and sleeping bags while Nordic provided the venue, food and registration support. Violet Gregg, 12, of Mapleton had attended a camp similar to Adventure Camp before and said her family enjoys camping near Shin Pond in Penobscot County. Gavin LeTourneau, 10, of Presque Isle, never camped before but was encouraged to try out Adventure Camp after hearing that a few of his friends also were going to participate. “It was fun to go swimming and on the trails,” Letourneau said, about his favorite camp activities.